We are now entering the storm of Fall 2017 video game releases and the pack is being lead by Microsoft’s simcade racing juggernaut, Forza Motorsport 7. Ahead of its September 29 launch for Ultimate Edition pre-orders, a playable demo has arrived on the Windows Store allowing players to get a taste of the 4K racing experience that is expected to be the showcase for Microsoft's upcoming Xbox One X console. The 22GB demo features 3 selectable cars, each paired to one of three tracks. Each track offers a unique glimpse at the new weather system that promises to change how drivers approach each race. Earlier this year at E3, Turn 10 promised that the PC version of Forza 7 was being built from the ground up on the Windows platform in an interview with Shacknews. PC graphics enthusiasts can get a peek at some of the graphics options used for our demo capture video below. The demo (and full game) makes use of a dynamic rendering system that will adjust settings up and down on the fly to ensure the best possible visual with a rock solid framerate. All options are configurable by the user and can be set to adjust themselves dynamically. Be sure to check out our guide to Forza Motorsport 7’s PC requirements to find out if your machine is up to the task of 4K 60fps gameplay. For a sneak peek at how the demo looks on a Windows 10 PC, check out our exclusive 4K 60fps capture below. You can grab the demo from the Windows 10 Store here. Racing games look so good now. Aside from some random stuttering and missing features that should be in a PC game, especially after the devs sat on the Shacknews E3 couch and said it was being built for the PC, it runs really well. 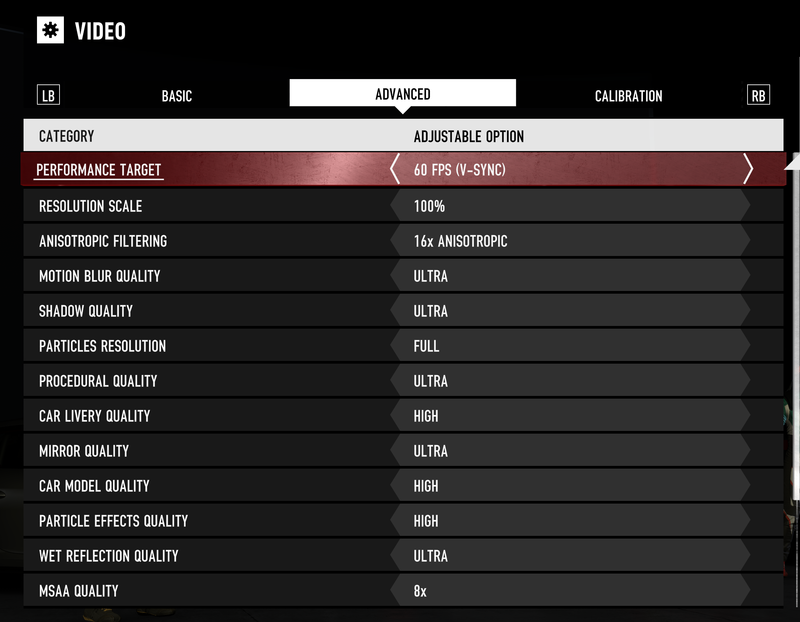 4K60fps at max settings is possible with a GTX 970 this time around. That's awesome. I wonder how a 8gb 480 would run it. Seems to run fine on my 480, ultrawide could use some work tho. Unlike Forza Horizon 3, the menus and in race HUD here are restricted to 16x9 space, which is kind of annoying. Well, it's fine for the menus but having the HUD stuff floating in the middle is rough. Not uncommon for some ports but really strange after FH3's ultrawide support. What about with a 1080ti????????? It also runs at 4K 60fps on the 1080 Ti. The game is being really stupid about hard framerate caps at the moment. Got it working. It sure is a pretty game ran it at 1080P @ ultra and it ran alright some stuttering and jank but like all Forza games on PC it feels 60fps then immediately 2fps then back to 60. The sound is really good the Porsche sounds like a Porsche and the GT-R like a tin can of angry bees. The out of the box wheel support is not good though on my T300. There’s a huge floppy area off center, it feels like those low budget gear driven wheels where there’s no centering or force feedback near the center. The force feedback is alright totally outclassed by any recent PC racing sim. There are a lot of settings to play with hopefully someone smarter than me will dial in a profile. It still has the Forza thing where the virtual wheel only turns 90 degrees. I have no more patience for racing games without a real world assist setting. GT cars do not race in the real world without traction control and ABS. I cannot say I have not played pcars 2. I am looking forward to it though. It feels like it’ll come down to how you’re going to play for the regular gamer. Only have a controller? Get Forza. Have a wheel? Get PC2. If you enjoy sim racing there is no question what to get. Maybe it’s different for other wheels but the wheel support and force feedback is bad in Forza 7 I should have figured given the horizons 3 wheel support is equally as bad. Demo keeps crashing. Looks like that's a thing so I guess I just wasted 22gigs of bandwidth. THANKS OBAMA!